What draws the attention to this set and most other Kensie bags are the padding elements which not only provide that feminine flair but also create added durability against dropping and mishandling. For checked bags like the 28-inch full included with this set, padding is especially important as it further decreases any unlikely damage from being loaded by airline personnel; its also more water and weather resistant during all your travels. 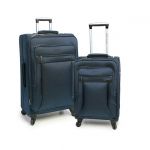 Other design elements for this set included a 20-inch carry-on tested for all national and international flights, and 360-degree spinner wheels on both suitcases to make your travels around busy airports more than comfortable. 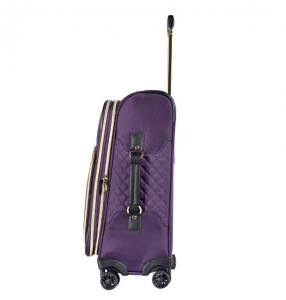 Each suitcase features a chic business formal look which is made accessible for travels everywhere by the fun-loving padded texturing on the face of both suitcases. Also, for a stylish third piece addition, like a Kensie tote, consider the Kensie Laptop and Tablet IPad Tote Bag; it works great as a personal item and is designed to protect your electronics. Storage consists of two main suitcases, one at 28-inches and capable of holding up to 120 liters of packing space, the other at 20-inches with storage space up to 45 liters. Additionally, both suitcases are expandable for up to 15% more packing space – that’s an additional two inches per bag. For shorter trips you should have no problem packing your bags to full and still have expanding room to pick up extra things and pack them home with you. For longer trips these bags offer packing space up to nearly 180 liters for a 2-3-week trip or longer (depending on how you pack). It’s also worth noting that whereas hardshell bags are more limiting, soft Kinsie luggage sets have that extra fabric stretch and therefore more packing room in every inch. Other storage features include 3 front facing pockets, one recessed into the lining, and one which is deep enough for your laptop or a single outfit and sweater. Interior designs include a deep central space with tie-down straps and a single zippered ceiling pocket. These interior designs are very similar to Atlantic’s Ultra Lite Softside Designer Bags, though perhaps a little more limited in space. 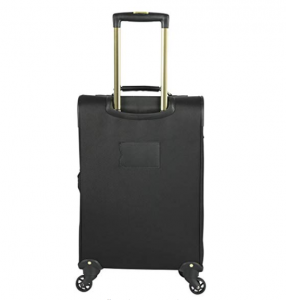 For this set, spinner wheels allow upright mobility with 360 multidirectional spin, these are coupled with a long telescopic handle to make pushing or pulling your suitcase more than simple. In tight confines or when raising or lowering your luggage from a carousel or a into an overhead bin, each suitcase also includes top and side haul handles. The back of each suitcase offers an insert for a card listing your information should luggage get lost. Interiors include a thick watertight lining along with dual tie-down straps, as well as a separately lined zippered pocket for extra organization that also offers adjustable garment compression panels with buckles to keep clothing flat and minimize wrinkling. Lastly, the best feature is the zippered expansion for up to 2-inches of additional packing space per bag; this is especially useful when it’s more budget friendly to choose a set with two suitcases rather than the standard three. Traditional luggage sets can include up to three suitcases, like the Nicole Miller New York Collection; however, where this does afford you more packing space for extended travel the drawback is always having to check an extra bag. Kensie’s Twill collection offers you the comfort of extended travel without the hassle of higher travel expenses, and both bags are designed to be lightweight for coasting right under those national and international imposed weight limits. The 28-inch checked bag only weighs in at 10.1 pounds unpacked, giving you plenty of leeway to pack as you need without going over an airlines limit. The carry-on size at 20-inches weighs in at 6.5 pounds unpacked and can be used on its own for a comfortable weekend trip. This Kensie set is not only sleek and elegant, it’s also very durable. Kensie uses ripstop woven cotton canvas materials for medium-high durability which won’t rip easily and protects your belongings in the event of drops or mishandling. Although cotton canvas isn’t as durable as nylon, these suitcases are much more durable than lightweight designs which employ polyester. These materials are an investment which will stand the test of time and ensure each suitcase is always suitable for your next adventure. 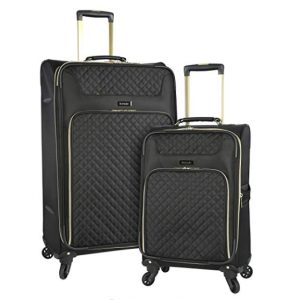 Kensie luggage sets also use 360-degree spinner wheels, and although these are weaker than in-line skate wheels, they’re still designed using high quality polypropylene and therefore capable of most hard travel including cobbled city streets; likewise, using the durable locking aluminum telescopic handle you should have no trouble getting around. Beauty meets practicality with this set that is both highly functional for extended travel and fashionable for those business trips where making an impression always matters. Even after years of owning this bag customers have found its style timelessly attractive and its materials and other facets perfectly preserved.  Included in the purchasing process are two main style choice, one which is black with a gold trim, the other which is purple featuring a gold trim. Each bag includes the ripstop weaving which gives your bag that fantastic texturing as well as the additional durability. 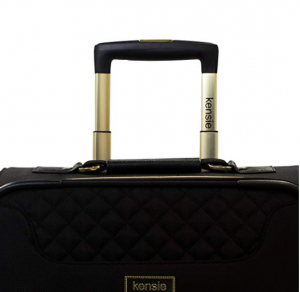 Finally, all suitcase purchased from Kensie luggage include the Kensie embossed logo attached into the bag, making you part of an iconic fashion brand whenever you’re traveling. One of the perks of owning a luggage set comprised of 2-pieces is that you never have to worry about the complications of a third bag, the suitcases in this set are the ideal measurements for standard travel lengths of up to 2 weeks, and enough extra packing space for up to 4 weeks (depending on how you pack). The large checked bag measures in at 28x18x10.5 inches, with an additional 2-inches of width when expanded. 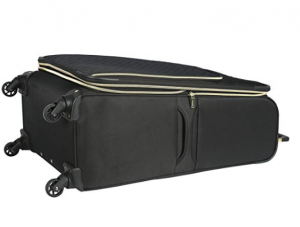 The carry-on bag measures in at 20x14x8 inches, and also has that additional hidden width when unzipped and expanded. These suitcases are nestable for easy storage when not in use, and upon delivery they come one inside the other to lower shipping costs. When arriving to an overpacked flight there is a chance that your carry-on luggage won’t fit, especially when fully expanded, however checking your bag at the gate should not result in any additional fees; the large 28-inch bag should always be checked before security. Kensie does not at this time warranty all of their suitcases and sets except on request and then only typically up to a 12-month warranty which covers repairs and replacements with some expense to the buyer for shipping and part costs. For more information ask your fashion distributor about warranty information or email Kensie headquarters. It’s also always worth keeping your receipt of purchase as proof for any warranty questions, purchases, or demands for replacement/repair. 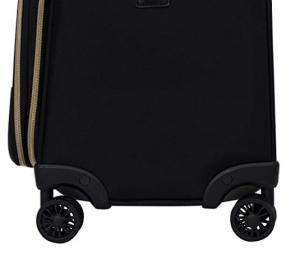 Kensie’s fashion brand has only more recently begun producing luggage for their loyal customers, but with the level of high quality workmanship these are still very trusted luggage options for travel all around the globe. 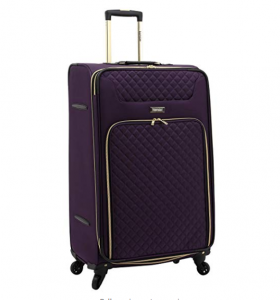 Kensie Luggage Sets are known for their women’s fashion designs that feature stylish feminine padding for a great look and also great durability. These bags are flexible for all your travels, especially if you’re choose the 2-Piece Twill Luggage set which is built to pack all your belonging in without the hassle of feeling like you need an extra bag. No suitcase is nonessential and both have their perks whether used together on a long trip or taken separately as you see fit. Though the spinner wheels aren’t as ideal as skate wheels for harder environments, both the checked bag and carry-on are made from fantastic ripstop woven cotton canvas, making these bags some of the most durable lightweight options on the market. The look together is classy and very business professional with a hint of playful femininity which will keep you traveling confidently with that little hitch in your step. Stylish feminine bags which don’t sacrifice storage for style. Ripstop woven cotton canvas materials; highly durable! No non-essential third piece of luggage. Expandable for up to 15% more packing space. Kensie has no clear warranty which is specific to their luggage. Spinner Wheels rather than Skate Wheels; for durability purposes. Interior organizational pockets are a little more limited for this collection.